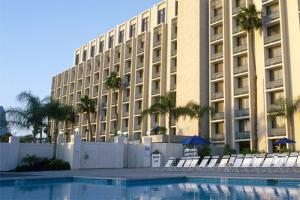 Knott's Berry Farm Hotel combines luxurious accommodations for both business and leisure. This 320-room deluxe property features a SNOOPY-themed wing, fitness center, pool with children's activity area, lighted sports courts and many other amenities. Dining options including Amber Waves, specializing in All-American fare and hotel room service. All located just steps from world-famous Knott's Berry Farm Theme Park and Knott's Soak City Water Park. Located just a few minutes from world-famous Knott's Berry Farm Theme Park and Knott's Soak City Water Park. Knott's Berry Farm Theme Park, Knott's Soak City Water Park.